Sandridge Bridge, via Vincent Quach. Enormous steel figures fan out along the bridge (they used to move out at sunrise and in at sunset) representing the indigenous people, and then nine successive waves of migrants. The bridge also hosts 128 panels for Melbourne residents’ countries of origin from Afghanistan to Zimbabwe. The Running Couple represents the refugee era, the period beginning in 1956 when Australia signed the United Nations Convention on refugees. This is a real advertisement from the Australian government. See more here. We are pretty good at resettling refugees. We receive people from all over the ravaged world, reserving spots for women at risk and people with disabilities or high medical needs. We give them a crash course in New Zealand life for six weeks in Mangere, partner them with trained and willing volunteers who help them settle in, and then generally treat them just as other citizens. But we don’t give very many people this opportunity. We haven’t increased the number of refugees we welcome since 1987. We are 90th in the international table of how many refugees we open our arms to, per capita. Here’s another embarrassing fact: 86% of refugees are currently being hosted by developing nations. Pakistan alone has 1.5 million refugees. Thailand, not even a signatory to the UN Convention, has more than 700,000. The rich world is not nearly pulling its weight. The New Zealand annual quota is 750 people whose home countries are too dangerous for them – or perhaps no longer in existence. They’re screened and chosen for us by the United Nations, though we also accept 300 more of their family members under a slightly different process, and another couple of hundred asylum seekers who arrive here outside the UN process are granted refugee status each year (somewhere between 6% and 30% of those who arrive under their own steam seeking asylum each year are eventually granted refugee status). Australia takes up to 20,000 UN refugees each year, five times more per capita than New Zealand, so in that department they are far ahead of us. With 59.5 million people now forcibly displaced from their home countries, the highest number since World War II, it is shameful that we are not increasing – or even revising – our intake. Our Prime Minister says our quota is ‘about right‘, in the face of calls from Amnesty International and others to double the quota, though it appears he hasn’t actually had any expert advice on the issue, and the Minister for Immigration now says he’s open to considering the figure when it next comes up for regular review next year. But I’m scared that not only are we not going to do so, but that if desperate human beings, like the Rohingya from Myanmar, start arriving here (by nautical miracle) in boats, that we may find we are no more compassionate, rational or humane than our neighbours in Australia. In 2013 Parliament passed the Immigration Amendment (Mass Arrivals) Act 2013 which allows ‘mass arrivals’, such as a group of asylum seekers coming by boat, to be detained for up to six months initially, and then month by month after that. As far as I can tell, this – like Australia’s practice – is contrary to our international law obligations, since we’ve signed the United Nations treaty on refugees, and have agreed not to detain refugees unless necessary. Just to be clear, we’re saying that when we come across people who have the legal right to have their case heard, and be protected and welcomed in the meantime, we will lock them up for months because they came by boat. Surely, surely we can do better than that? This is horrifying and not consistent with our migrant history, our other, excellent, refugee resettlement practices or in fact anything except Australia’s example. It has not yet been used. May it never be. Use the military to turn the boats away; do everything possible to stop them reaching Australian land. Tow the boats back to their countries of origin, even if that means the asylum seekers are prosecuted at home for leaving the country illegally. Pay other countries with poor infrastructure and human rights records themselves (Papua New Guinea, Cambodia) to take refugees who arrive in Australia by boat. Restrict the briefing of the media on the subject of asylum seekers and ban media access to asylum seekers or detention centres. Send any refugees who do reach land for ‘processing’ to other countries. Detain (by which we mean ‘imprison’) asylum seekers in detention centres, contrary to obligations under the UN Covenant. Detain asylum seekers in poor conditions amounting to cruel and degrading treatment, where their physical and mental health suffers. Ignore calls from national medical bodies to close these centres. Detain asylum seekers for years. Pay those piloting the boats to turn around. Make it an offence, punishable by imprisonment, for doctors and teachers in contact with asylum seekers to speak publicly about their concerns. The UN High Commissioner for Human Rights calls Australia’s practices ‘hostile and contemptuous.’ Please, let’s not go down this path. South East Asian nations (none of whom have signed up to the UN Convention) followed Australia’s example recently when human traffickers abandoned thousands of asylum seekers from Bangladesh and Myanmar. Thailand actually towed boats from its waters into international waters in order not to have to deal with these people. Indonesia and Malaysia did the same until the situation became embarrassing internationally and a partial, interim solution was found. If asylum seekers start arriving in New Zealand in larger numbers (this is unlikely given our distance from every other nation on earth) I have no confidence that our government would do anything different from Australia’s appalling example. We have to think in advance about the right way to respond, so we don’t get dragged into this obscene behaviour. …[I]n Aceh, the refugees were welcomed with a concert on 29 May that was organized by Rafly, a popular local singer who like many Indonesians uses only one name. The event was held to raise money for the refugees and it was also a Pemulia Jamee, a traditional Acehnese ceremony to honor guests, which opened with the thunderous beating of more than 50 Rapai Pasee traditional drums. Let’s be like Aceh, eh? It’s hard to remember, sometimes, that political borders dividing countries are an artificial construct. Have a look, if you like, at this wondrous collection of photographs of borders. The Macau-Mainland China one is hilarious. Some of the others are terribly sad. They all make the point, in different ways: borders are arbitrary, powerful and morally dangerous. It’s convenient to organise ourselves into nation-states, but if our loyalty to the arbitrarily-limited body of people we happen to be part of goes beyond cheering for a sports team, then we are making an idol out of our citizenship. All human beings are made in the image of God. Patriotism is utterly irrelevant to following the way of Jesus Christ. And if that’s true, then what makes me and an Iraqi refugee any different? What makes one of us more deserving of living a calm life in New Zealand? On what basis can I justify keeping this beautiful land for myself? Deep in the identity of the Jewish people, as we watch their history unfold in Scripture, is the notion that they were once unwelcome foreigners in Egypt until God rescued them. 2 ‘I am the Lord your God, who brought you out of Egypt, out of the land of slavery. The exhortation to treat foreigners well is a theme throughout the Hebrew Bible, and continues into the New Testament. Jesus includes the Gentiles (anyone who is not Jewish) in his stated mission to redeem the world. The first big ruckuses among his early followers resulted in expanding Jewish privileges to all people following Jesus. A God Speaks billboard, image credit unknown. May we all live up to the Samaritan’s example and Emma Lazarus’ exhortation. May our nation be a Mother of Exiles. I know I’m flipping lucky to have been born in New Zealand, with all the privileges that go along with that. Someone born in Sudan, Syria or Myanmar is unluckier, in some big ways, than me. If they want to come and live here, then what right do I have to keep them out? How can a desire to keep New Zealand for the lucky ones who are already here be anything other than the worst kind of selfishness? We have no right to reserve our islands for the lucky few. We did very little to deserve our place here – perhaps nothing at all – and our bountiful luck needs to make us generous and open-armed. 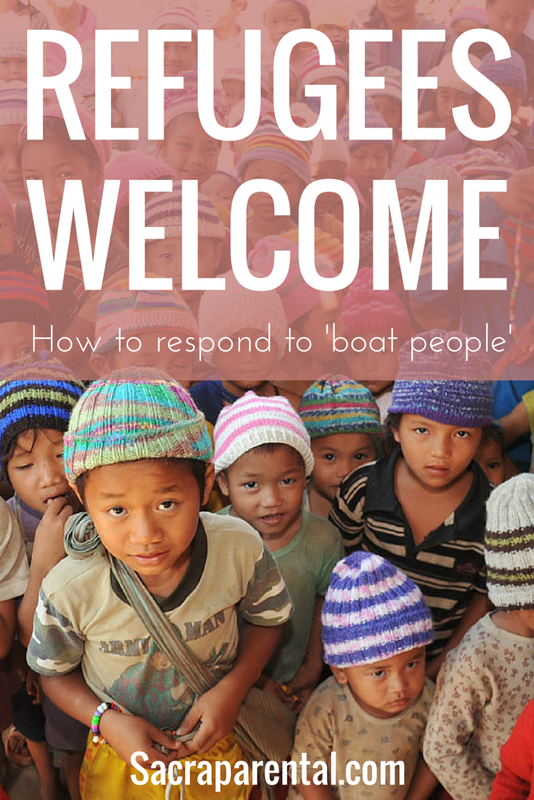 We should welcome more refugees because it is the right thing to do. As it happens, it’s also a beneficial thing to do. An economic analysis of the effect of a small Australian town welcoming a large group of Karen refugees from Myanmar found an economic benefit of $41.5 million. And as Sam Kilpatrick wrote, some time ago, being supportive friends with refugees is an enriching experience that brings benefits to all parties. Like Sam and, actually, quite a range of other people I know, I have volunteered with refugee resettlement support, and it’s been a overwhelmingly positive experience for all of us. Jade says while being part of their lives is rewarding, one of the most important parts of the role is introducing the refugee families to New Zealand culture. Not only does Jade take them to local community events, but also invites the families to her own family events like Christmas celebrations. When we’re forming our refugee and migration policies, and when we’re scanning the horizon for boats, let’s be like the Acehnese, like Dave Dobbyn, like the Mother of Exiles, like the Good Samaritan. If you see a rickety boat coming towards you across the sea, full to the gunwales with brave, frightened people, make sure you give them a welcome to be proud of. If you’re newish to Sacraparental, you might like to check out the Sacraparental Facebook feed, with daily links and resources, my Twitter feed and my Pinterest boards, especially the topical Change the World. Urs Signer has put together a Facebook group for people who’d be willing to open their home to a refugee. Thanks, Heather. Yes, I’ve signed up there. Agreed on all you say about it – I figure it is a pretty good gesture, though only that – it’s really about saying that Key can’t blame the rest of us for his inhospitality.